Finca del Arte now La Finca Chayofa Meson restaurant. Finca del Arte now La Finca Chayofa without art. Finca del arte's stunning art gallery is history now because, its owner Wolfgang Egger died in 2012. The tall German of much charisma seemed to be a healthy man in his fifties. In the past, the Tenerife holiday home insider loved to savor delicious cake there under a large shady tree after browsing the art gallery. She learned about a drastic change from the management of the new owners, way back in 2014. That's when she was told that her friend could not exhibit her paintings there, any more. What reminds the former Finca del Arte ? Pride of India tree and subdivision. The looks of La Finca which once featured art exhibitions has changed very much. However, the two Pride of India trees are still there. 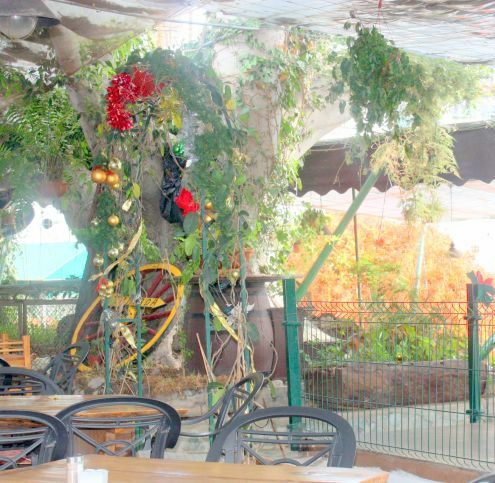 So is a huge, light tree trunk of intricate carvings that serves as a bench. It still stands at one end of "the same old terrace". Note that the lower, sunny terrace section is now fenced off partly. No more views to the mountains, by the way. La Finca Chayofa by changed name. 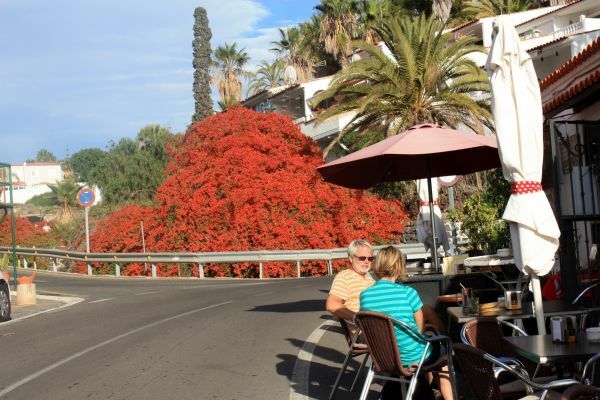 On first of December 2016, a friend and the Tenerife holiday home insider had a sumptuous afternoon lunch there. 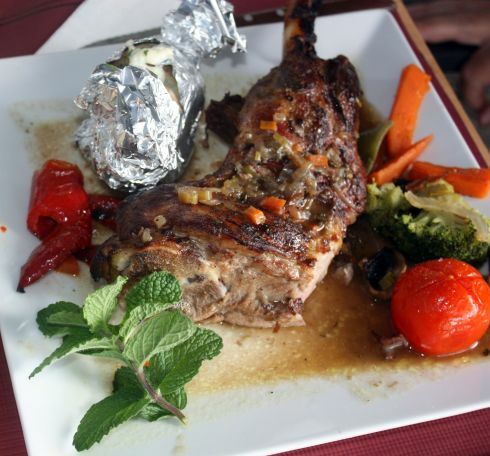 The Leg of lamb Cordero La Finca which was ordered by the friend was absolutely superb. Finca del Arte alias La Finca Chayofa with superb Cordero. This meat may become a culinary legend. A genuine trophy of the important art of cooking. Only the bone was not eaten. 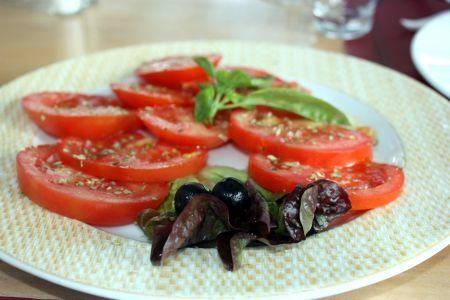 Tomato salad perfectly seasoned with oregano. The tomatoes made ideal starters with a delicious sauce, already. 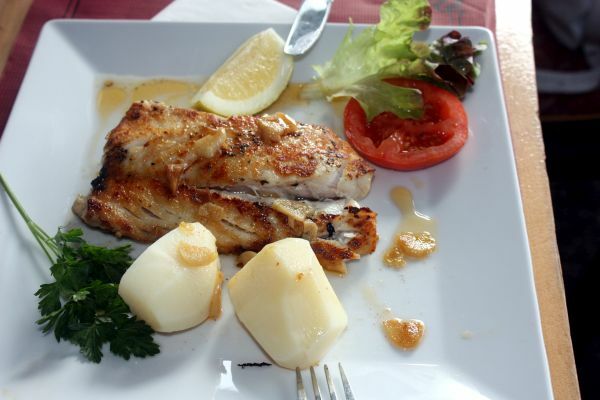 A fillet of Cherne Stone Bass was ordered by the Tenerife holiday home insider. Cherne a la Parrilla grilled stone bass. It was good, except for a tiny end peace. However, it's known that that part of "Cherne" Stone Bass has an extremely strong fish taste near its head. That's not liked by everybody. 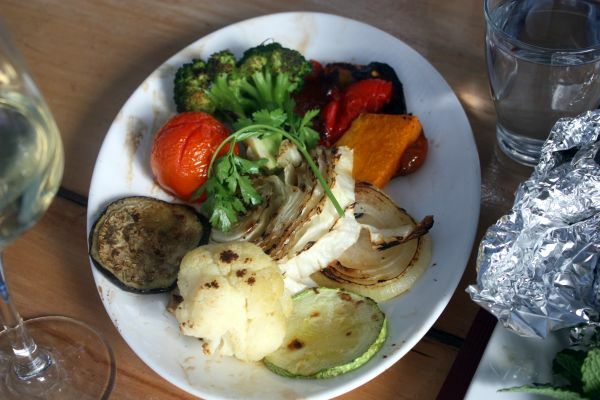 Some extra brazed vegetables in season were an additional Canary Island cuisine dish. Its fried red pepper was most tasty. The red and white wines of the house by Finca del Arte alias La Finca Chayofa are recommendable and not expensive. Desserts were mostly of the commercial type. 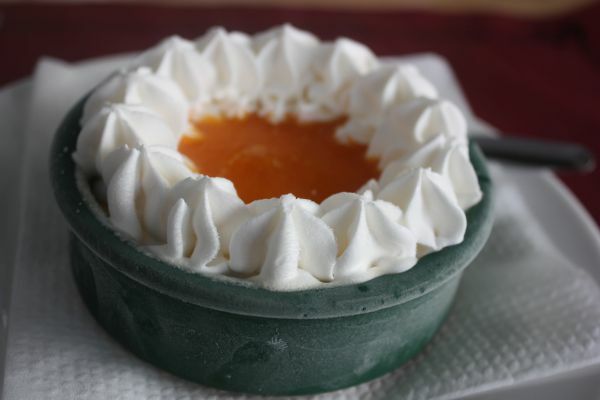 In the past, desserts served by the art gallery were pretty much like today at La Finca Chayofa. However, it needs to be confirmed that cakes are still as good. 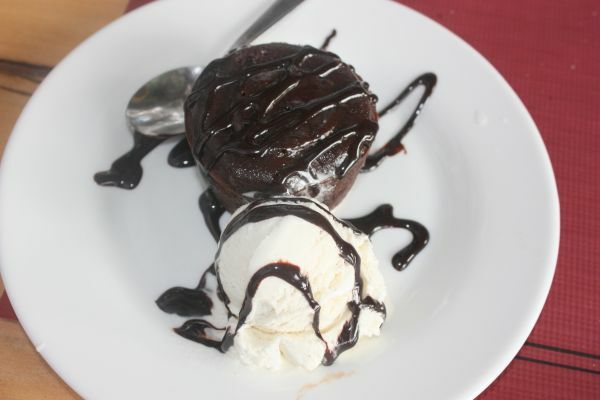 The Coulant de Chocolate a hot chocolate cake served with vanilla ice cream by la Finca Chayofa was delicious. Tarrina al Whisky a very frozen dessert. The Tarrina al Whisky with cream came straight from the freezer. This made this sweet hard like rock. Any taste of liquor was lost. This table barbecue the photo of which is courtesy of a large international review portal speaks for itself. 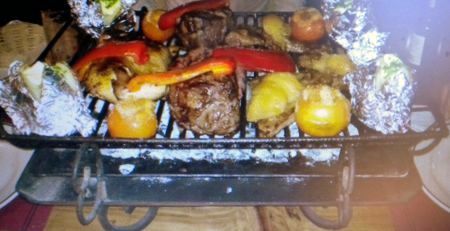 The grill is made of sturdy wrought iron and it's of a generous size. Not only meat but also potatoes, onion, sweet peppers and vegetables grown on the spot find space on it. The charcoal as well as the food are provided for you to cook. Our restaurant bill for two. Skipping the extra plate farm vegetables which were not needed would have bought us more drinks instead. Anyway, the total bill for 6 dishes with wine and additional water was Euro 47 inclusive tax. Other looks than former Finca del Arte. No more art exhibitions adorn walls or floors inside. There are some black and white photos of the region. The interior of the building looks like an event party room. 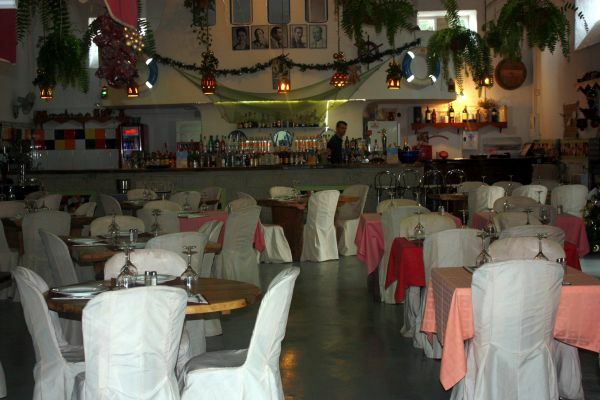 There, tables and chairs of festive attire meet the eye in front of a huge bar. Party room for weddings etc. La Finca Chayofa new terrace look. The outside of Finca del Arte which was farm garden only befofe has also changed completely, as shown in the photos above. A plastic roof keeps maintenance and costs low under messy ancient trees. The second level is on lower ground in the sun and has even a kiosk to buy things. 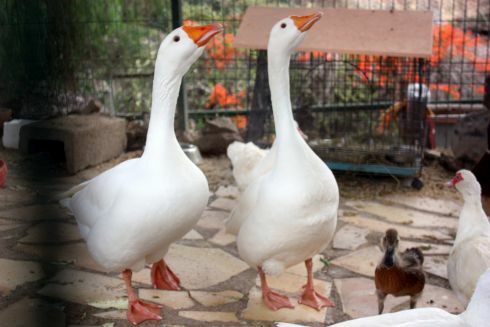 Caged white geese at Chayofa. 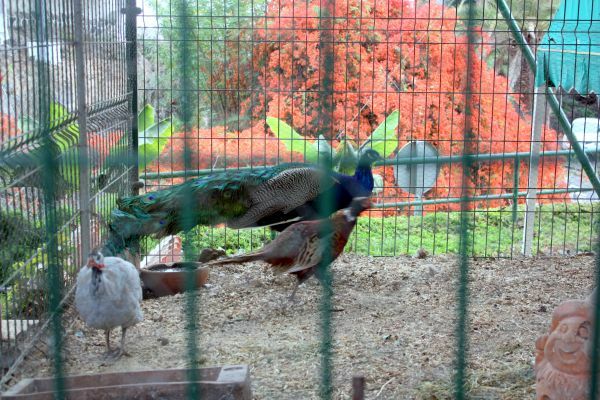 Pheasants at the Chayofa restaurant. Discover some tall cages by the far end which are almost attached to the mansion. They house poultry of all sorts. Not to be classified as free range but interesting for little kids, nevertheless... Even a rabbit is in the back of the tiny duck and geese pond. 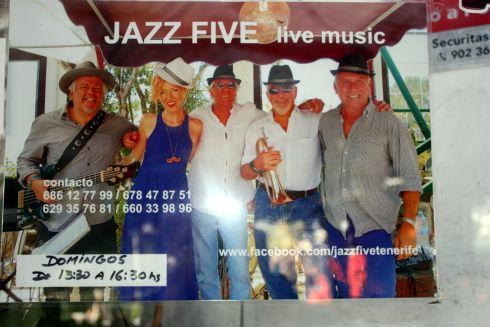 Live music daily and Sunday afternoon Jazz. 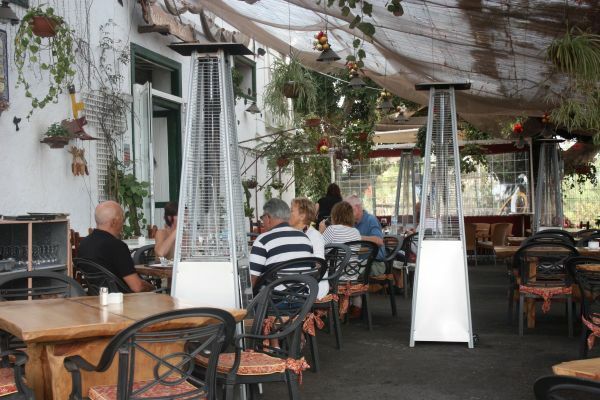 Jazz is played on Sundays from 1.30p.m.to 4.30p.m. Live music from late afternoon onward. Some days are dedicated to Pop and Latin music, others feature traditional tunes of the island among other. Google maps or route finder are a must to get to this place. Why? 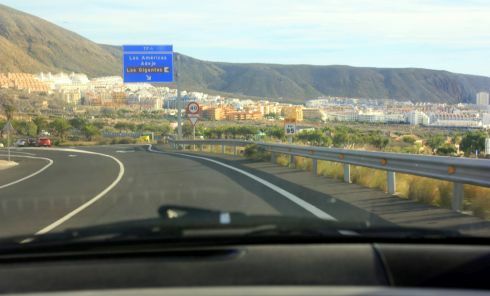 We took the TF28 up the hill by the traffic circle on top of Los Cristianos. Calle El Taroso 2 Treehouse bar. La Finca Calle El Taroso. 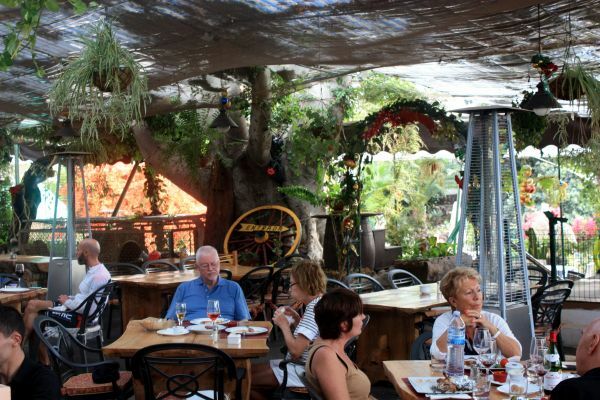 We wouldn't have found La Finca, nor the Tree house bar at Calle El Taroso or the country club nearby, easily. We were lucky to get directions from a local. That was on a Thursday at Siesta time at 3p.m. in deserted la Chayofa streets. Otherwise, mind km 72 from the TF1 Freeway to get to the TF28 Chayofa turn-off. 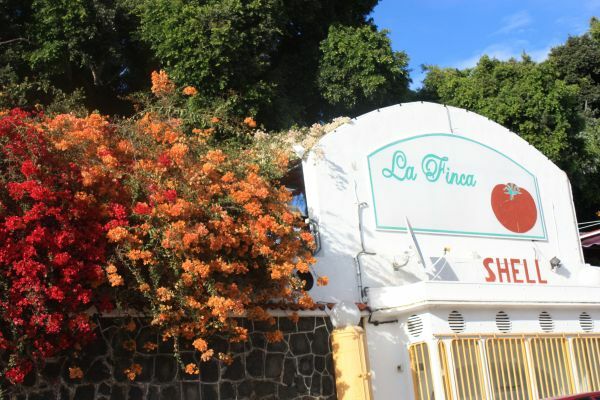 From Finca del arte back to Tenerife restaurants.